Photographer unknown at this time. If the '31-1' on the cabside and 1-31 in the headcode box of this partially completed Class 25 is accurate, then this view shows D5216/25066 under construction at Derby during the spring of 1963. Quite possibly the locomotive behind it is D5217/25067. A career of eighteen years saw D5216/25066 allocated to London Midland Region & Scottish Region depots. Time between last Classified repair and withdrawal: 13 months. Time between withdrawal and scrapping: 20 months. 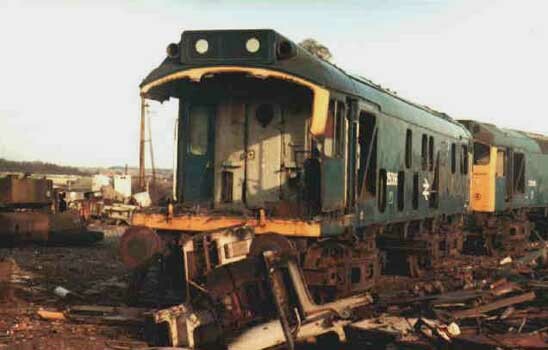 25066 was the 106th Class 25 to be withdrawn, one of two retired during June 1981. 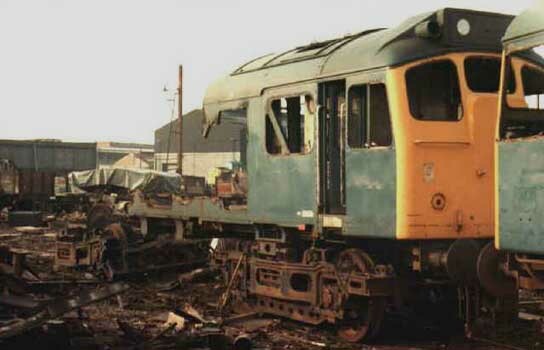 After withdrawal 25066 was stored at Toton, by February 1982 25066 had reached Derby Works, it would be scrapped here by March 1983. 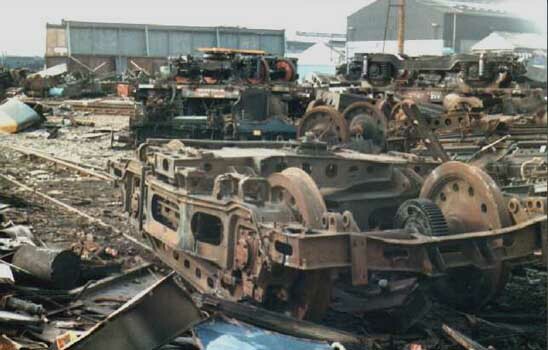 Noted Derby Works October 1975. Noted Glasgow Works March - May 1980 (Intermediate). 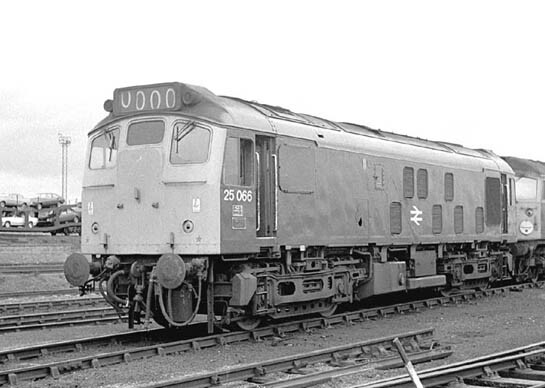 Constructed at Derby Works during the second quarter of 1963 D5216 was delivered to Toton (18A) in July. D5215 & D5216 made their test run to Corby together on July 9th 1963. D5216 was transferred to Cricklewood (14A) in August. On September 8th D5216 worked the 17.12 Moorgate - Luton commuter service. D5216 visited Derby Works during November. On December 30th D5216 was noted passing through Clapham Junction with an inter-regional coal train (6O36). Condition December: green livery with small yellow warning panels, curved upper corners, warning panel covers frame level stripe, no blanking plates, hand/footholds present. On August 31st 5216 & 5232 worked the summer dated roundtrip Nottingham - Llandudno Town. Condition October: green livery with small yellow warning panels, curved upper corners, warning panel covers frame level stripe, gangway doors in place, no blanking plates, hand/footholds present, three-rung bogie mounted footsteps, ridge sided sandboxes. A visit to Cricklewood at the beginning of February found 5216 awaiting movement to Derby Works for the repair of collision damage. Condition August: green livery with small yellow warning panels, curved upper corners, no frame level stripe, gangway doors in place, three-rung bogie mounted footsteps, ridge sided sandboxes, no blanking plates, hand/footholds present. On February 7th a Leicester - Liverpool football special was worked roundtrip (?) by 5216 & 5223. Gatwick Airport was host to two specials from Leicester on March 11th & 12th, hauled by 5219 & 5222 and 5216 & 5222, the empty coaching stock beginning the day at Etches Park. Photographer unknown at this time During its long stay at Cricklewood 5216 received the corporate blue livery of the 1970s here featuring the numbers on both cabs and the 'barbed wire' symbol in the central position. The nose end doors have yet to be plated over, the standard two rows of four grilles are featured on the left side and the boiler room grill does not yet carry a blanking plate. The gas holders in the background reveal this can only be St Pancras station. 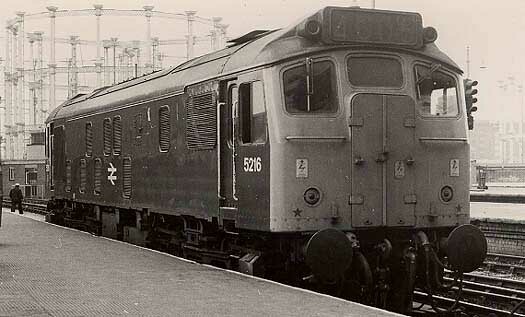 On September 8th 5216 & 5186 worked a scheduled roundtrip Leicester - Skegness service. On March 23rd the 'Great Central 75th Anniversary' railtour from Marylebone to Loughborough and return was worked by 25066 & 25070. On October 5th a Marylebone - Ruabon excursion set out with 25067 & 25066, however trouble befell 25067 en route with the machine becoming a total failure at Wolverhampton. 47195 came to the rescue with the two Cricklewood Class 25s visiting the delightful environs of Bescot for the rest of the day. 25066 & 25108 worked a roundtrip Burton - Yarmouth excursion on July 6th. Repairs were carried out to 25066 at Derby during October. On December 31st 25066 worked an early morning roundtrip Derby - Matlock service. 25066, 25122 & 25196 were all noted on February 25th handling local Tyne Yard duties. On March 25th 25066 worked a late afternoon roundtrip Derby - Matlock service. 25066 was pressed into service on April 29th's 17.05 Shrewsbury - Wolverhampton service due to a shortage of diesel multiple units. On July 15th 25066 was noted passing Bristol Bath Road depot with a single wagon loaded with lineside cabinets. On July 24th 25066 & 25124 worked a scheduled roundtrip Derby - Skegness service. A week later on July 31st 25066 & 25121 worked a Norwich - Aberystwyth day excursion roundtrip between Shrewsbury & Aberystwyth. On August 12th 25066 worked the 7J44 Great Chesterford - Whitemoor (?) freight. During October 25066 was transferred to Springs Branch. On April 9th 25066 with five Mk1 coaches worked the 10.00 Liverpool Exchange - Manchester Victoria 'Liverpool Exchange Farewell' railtour, for a total of 215 miles. Departing from Liverpool Exchange the railtour ran to Kirby - Manchester Victoria - Castleton - Rochdale - Miles Platting - Manchester Victoria? - Bury Bolton Street - Manchester Victoria - Blackburn - Preston - Blackpool North - Bolton - Southport - Liverpool Exchange (also reported as Southport - Bootle Junction - Edge Hill - Liverpool Lime Street). During May 25066 was transferred to Haymarket, spending the next three and a half years allocated to Scottish depots. 25066 worked an unidentified passenger service between Perth and Glasgow Queen Street on May 14th. On July 4th 25066 worked the 21.40 Edinburgh - Carstairs. On August 23rd 25066 worked the 21.40 Edinburgh - Carstairs. Four days later on August 27th an Inverness - Birmingham New Street relief was worked to Mossend by 25066 & 25026. Photograph collection of webmaster On April 9th 1977 the Wirral Railway Circle ran an excursion to recognise the closure of Liverpool Exchange station. The tour ran with 25066 and five coaches from Liverpool Exchange to Manchester Victoria. It is seen here at Bromley Cross. 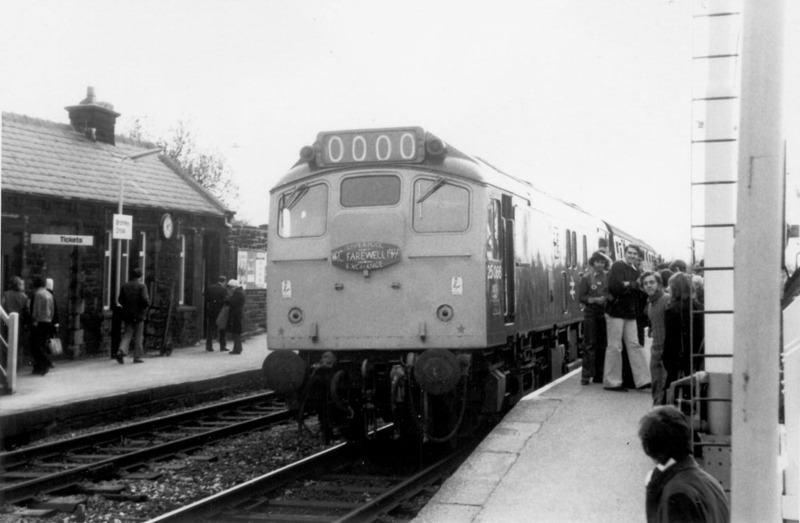 Photograph courtesy Tony Sayer 25066 at Millerhill on October 30th 1977. The nose end doors have now been sheeted over, the boiler room grill is now a solid plate and with this being the right side the ventilators show the typical top row with three, the bottom row with four. On January 11th the 17.20 Edinburgh - Dundee was formed of locomotive hauled stock with 25066. March 11th saw four military specials run from Rosyth to Ludgershall. All changed locomotives at Newcastle, 1Z72 arrived behind 40030 and left with 25066 (HA) & 25232 (ED), this pair had brought in 1Z73 surrendering that to 47273. A strange maneouvre assuming it is reported properly, which would suggest that the pair of Class 25s were the only machines to make the whole trip, but having worked two separate trains! On November 27th 25066 worked an Edinburgh - Carstairs service. On December 18th the 21.45 Dunblane - Glasgow Queen Street service was worked by 25066. On June 27th 25066 worked the 09.35 Glasgow Queen Street - Aberdeen. On September 4th the 14.44 Glasgow Queen Street - Dundee and the return 17.33 Dundee - Glasgow Queen Street were worked by 25066 & 26044. On January 26th the 11.05 Perth - Edinburgh was worked by 25066. 25066 at Polmadie on March 15, 1980 just prior to entering Glasgow Works. 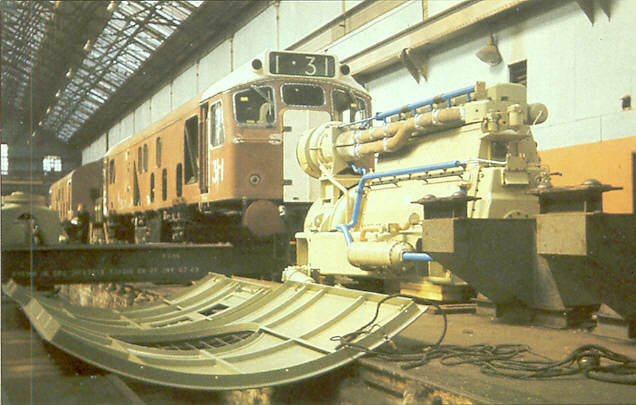 25066's final classified repair, an intermediate, was carried out at Glasgow Works during March - May. On entering the Works 25066 carried the non-standard Battery Isolating Switch Cover (three circular hinged discs), during the overhaul this was changed to the standard cover. After its release from Glasgow Works 25066 was quite active on a number of passenger services. On May 8th an ex-works 25066 & 27044 worked the 10.44 Glasgow Queen Street - Dundee and the 13.39 Dundee - Glasgow Queen Street. Two weeks later on May 17th 25066 worked the 22.36 Mossend Yard - Glasgow Queen Street forward from Cowlairs Junction to Glasgow Queen Street. On May 19th the 10.44 Glasgow Queen Street - Dundee and the 13.39 Dundee - Glasgow Queen Street were worked by 25066 & 26044. A week later on May 26th the 06.40 Glasgow Queen Street - Dundee was worked by 25066. 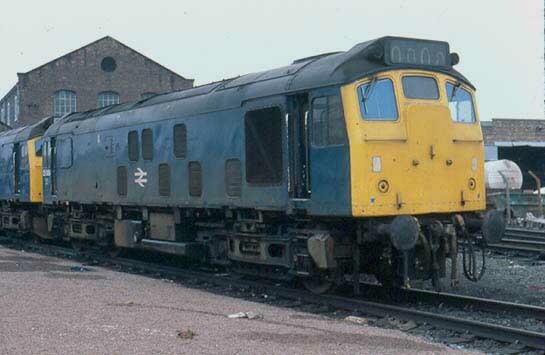 Condition June: blue/yellow livery, gangway doors sheeted over, blanking plates fitted, hand/footholds plated over, three-rung bogie mounted footsteps, straight sided sandboxes, large bodyside number. On July 16th 25066 worked the 14.44 Glasgow Queen Street - Dundee, whilst on July 19th 25066 worked the 06.35 Carstairs - Edinburgh. The 23.15 Kings Cross - Aberdeen on August 9th was worked forward from Edinburgh by 25066 & 25026. Two days later on August 11th the same pair worked the 09.50 Aberdeen - Glasgow Queen Street. On August 20th 25066 worked the 05.55 Stirling - Edinburgh. On September 6th a roundtrip Glasgow Queen Street - Dundee football special was worked by 25066. During November 25066 was transferred to Toton. During March 25066 was transferred to Cricklewood, this would be its last transfer. On April 20th, (Easter Monday) 25081 & 25066 handled a Melton Mowbray - Southport mystery excursion. On April 27th the late morning Wellingborough - Acton freight was worked by 25101 & 25066. On May 5th the 07.40 Bedford - St. Pancras was hauled by 25066 & 25085. 25066 was noted at Clayton Bridge on May 16th running light engine. On May 25th a Leicester - Llandudno Bank Holiday excursion failed behind 47353 at Stoke-on-Trent. The Class 47 was replaced by 25066 & 25050, the Class 25s also handling the return leg. 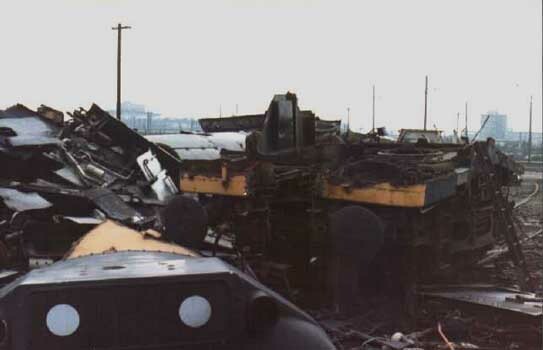 25066's stay at Cricklewood was brief, a main generator flashover led to its withdrawal on June 21st 1981. Despite having recieved an Intermediate repair at Glasgow Works about a year ago, repairs would not be forthcoming. At some point 25066 was moved north to Toton. 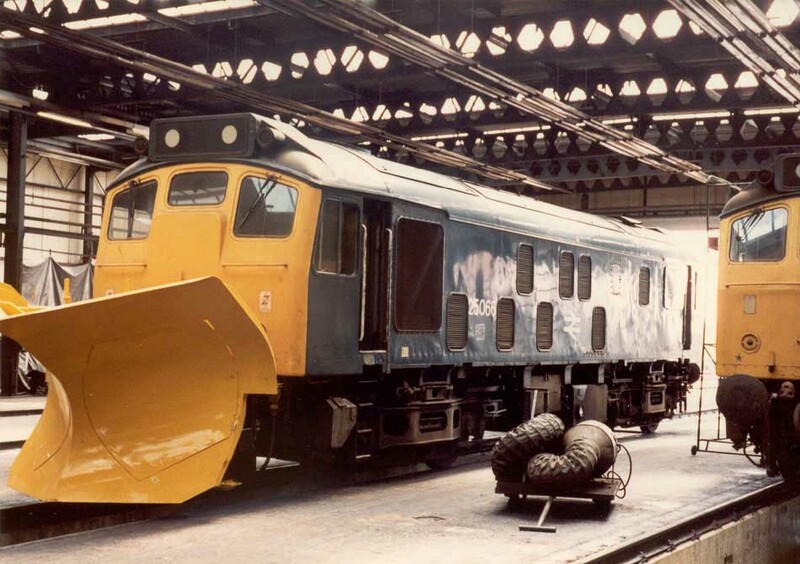 Photograph courtesy Jerry Glover 25066 at Toton on July 29th 1981 equipped with a fearsome looking snowplough. 25143 is on the right. 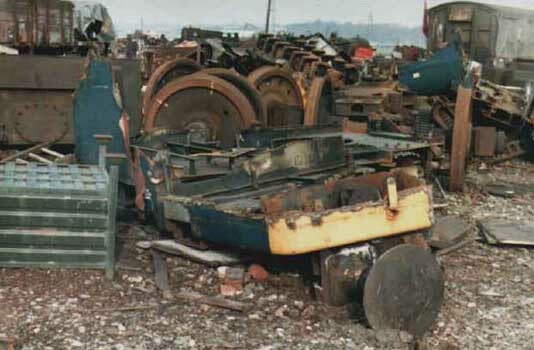 As the year opened 25066 was still dumped at Toton but during February was moved to Derby Works. 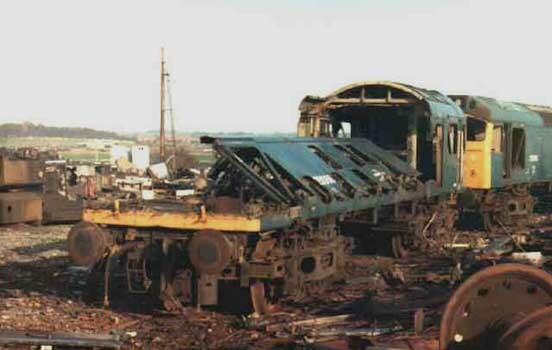 25066 had spent a year dumped in Derby Works, being stripped of spares before the remains were scrapped in February, just a few months short of her 20th anniversary. With thanks to Mr B for the views below. 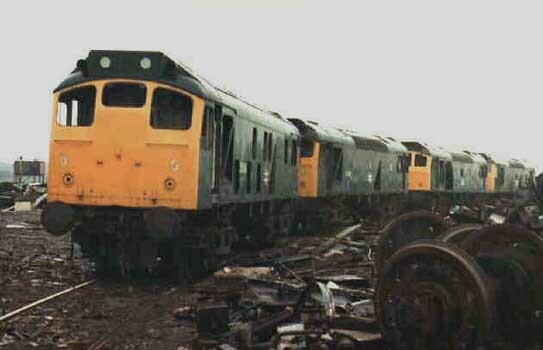 A miserably damp unknown day finds four heavily stripped Class 25s dumped in the scrapping area at Derby Works. 25066 is nearest the camera. The cutters have started work on the line of Class 25s, 25066 is the first to be dealt with, the 'A' end cab is the first part of the locomotive to be cut. After the 'A' end cab has been disposed of, the roof and sides are next for the chopping block. Next to go is the floor from the 'A' end cab back to the boiler room behind the 'B' end cab. The exposed bogie has then drawn the attention of the cutting crew. The 'B' end cab has been cut back to the frame level, now the floor is being chopped up, whilst the pile of scrap to the left grows larger. The end is near for one of the bogies, already the cutting crew have started to make cuts into the bogie frame. Part of the cab floor and a buffer has been tossed aside for the moment, whether it comes from 25066 is a hard to confirm, but it certainly signifies the end! Page added February 20th 2000. Last updated Aprill 11th 2019.